With all the new EPDs and Indexes, it can be hard to pinpoint what efficiency means for you as a producer. Cows that produce well and don’t eat a lot? Calves that will finish faster with less feed and high quality grade? Cattle that can thrive in harsh conditions? Cattle that can handle fescue country? In 2010, while visiting with friends at the American Angus Association annual meeting, the importance of feed efficiency in the livestock was discussed. Those conversations spurred us to find a test station to see how the Green Garden herd was stacking up to others in the Angus industry. For forty plus years we have been identifying our most efficient cows by comparing cows weight in relation to the calves weaning weights. In 2004 the American Angus Association introduced $Values, giving us another selection tool to help identify our efficient cows, and also validate what we have done so far. In 2010, we took a challenge from Dr. Craig Hayes to see how well our Calving Ease and High Marbling genetics would do in a feedlot testing facility. 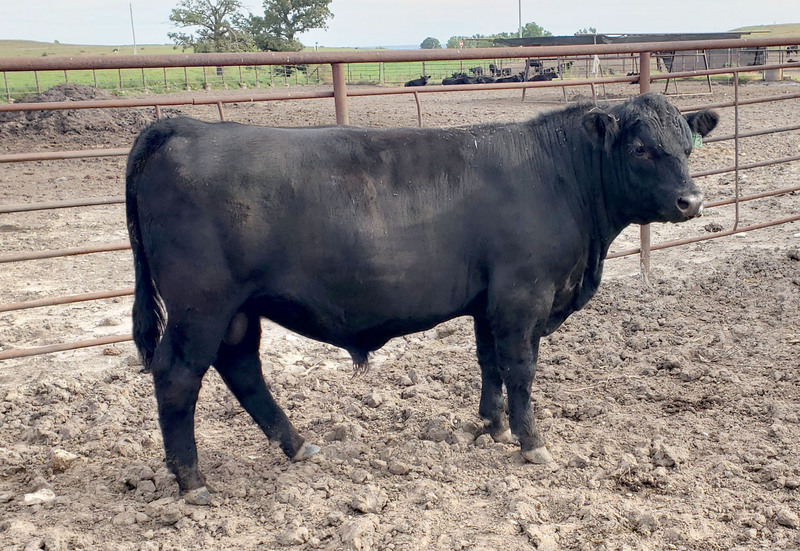 The perception has been that high growth cattle are very efficient in a feedlot setting, but when you add high marbling, calving ease genetics to the mix, their feed efficiency goes down. We sent 25 bulls out of 5 different sires to the Hays Beef Development Center in Iowa, to find out who was eating how much and who was converting well. The results of that 1st test showed a significant difference in individual data, some of the animals that we assumed would do well ended up at the bottom of the list. The lowest DMI (Dry Matter Intake) was 19.0 and the highest was 29.7, from a feed cost point of view that is a huge difference. Gardens Pay Back was one of the first animals we put through feed test in Iowa. He is #51 of Current Angus Sires for DMI with -1.30, he also has an RADG of +.29 putting him in the top 10% of the breed for feed conversion. That means that he doesn’t eat much, and what he does eat he converts into pounds. While on test Pay Back ate 18lbs of feed a day and gained 5.29 lbs/day with an adjusted yearling weight of 1215. While another bull in the same test, Gardens Image M01 ate 32 pounds of feed and gained 5.01 pounds per day and weighed 1230 at yearling. The comparison made us sit up and take notice, if we could consistently produce cattle that eat 5 to 15 pounds of feed a day less and still have the same amount of gain, that would be a huge economic benefit to our customers. His sire Gardens Tsunami I36 is the #39 DMI bull of the breed, his ADG was 4.64 and his adjusted yearling weight was 1315. These animals are not scrawny, non-performing cattle, they are simply extremely efficient, while keeping mature size in check. They are not the biggest animals, but they are by no means the smallest. This is where we think the industry is heading, especially with the blowback we are starting to see from packing plants about carcass size. We continued testing bulls in Iowa for the next 3 years, 25 in the spring and 25 in the fall, and continued to see a wide spread from the highest and lowest intake animals. Additional feed efficiency studies led us to consider testing our young females as well as bulls. So in 2013, we installed our own GrowSafe system, now we can test all of our young animals without having to pick and choose who we think will do well. Our replacement females are selected from the top 1/3 for a combination of DMI and ADG, along with our stringent carcass requirements. We are seeing a directional change in our program using the information from the GrowSafe System, and look forward to seeing how we can keep improving our product for our customers. Today Green Garden has 4 Current Sires, 10 Current Dams, 29 Non Parent Bulls and 12 Non Parent Cows in the AAA top 100 list for DMI EPD. Some people say "Great, but doesn’t that just mean they are smaller cattle?" That all depends on how efficiently they convert what they eat. There are a few facts of life, one of those is that maintenance levels for a larger body mass are simply more than for a smaller body mass. Some of this can be offset by the feed efficiency of the individual animal. Now we are making breeding and culling decisions on our females with actual feed intake performance, not just on animal weight and height. We had a few surprises along the way, there were some smaller cows that were not the efficient little wonders we thought they would be, and we had some larger animals that consistently converted feed better than their smaller counterparts. We now have several years of feed intake data on our yearling heifers. This year, we had the opportunity to be part of a new research study being conducted by the Oklahoma Sate University. They put together twenty low intake high/efficiency females (19 from Green Garden) and twenty high intake/high growth females to compare cow feed efficiency and mature cow maintenance levels. We are very excited to see what comes of this study in the future. When you are feeding out your calves, weather in your own pens or in a feedlot, F:G is an important number for you. This is where our GrowSafe numbers come in very handy. One of the easiest to compare is from one of our first groups that we fed out in Iowa. Bulls A and B, each gained 4.73 pounds per day. Bull A consumed 14.2 lbs of feed a day, while Bull B consumed 30.3lbs. For every pound of gain, bull A consumed 3.04 lbs of feed, and Bull B consumed 5.77 lbs of feed. The difference in the feed costs between these two animals is substantial. If we keep it simple and say that each pound of feed costs .50 and each bull needs to gain 500 pounds to get to slaughter weight. Bull A would cost $760 and Bull B would cost $1,442.50, simply on feed. Another example of how feed efficiency effects your bottom line, Bull C and Bull D both ate 23 pounds of feed per day, Bull C gained 5.3 pounds per day and Bull D gained 3.36 pounds per day. To gain 500 pounds to get to slaughter weight, Bull C takes 95 days, while Bull D takes 149 days. We are trying to couple these two traits together to make animals that finish in less days on feed and eat less pounds of feed per day. We are now getting to the point where we are feeding animals that have been bred with feed efficiency in mind from a feedlot standpoint, and the results are encouraging. One bull from our last group of Falls ate 15.5 pounds per day and gained 4.9 pounds, for a feed to gain of 3.16. Aside from the phenomenal difference between that and the commercial feedlot average of a feed to gain of 6.0, he was bred to be a good converter and he performed that way too. His sire is Gardens Pay Back with a F:G of 3.4, and his dam had a F:G of 4.6, her mother had a F:G of 2.7. Now that we know how to save money getting to the slaughter floor, let's take a look at premiums when you get there. With our genetics hitting the best premiums and the least amount of discounts is very possible. Not only can you save on inputs getting to slaughter, when you get there you are more likely to have carcass quality in the upper 2/3rds of Choice and Prime premiums, while still being able to pick up premiums on YG and avoid discounts on carcass weight.